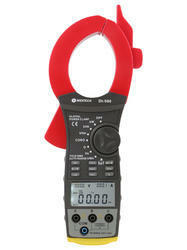 We are a reliable source to procure Digital Clamp Meter. This device is an electrical instrument having two jaws which open to allow clamping around an electrical conductor. This is used for measuring the electric current in the conductor with ease. We provide these instruments with low battery indication. We are offering a wide range of Digital Power Clamp Meter DT900. This device allows the user to make safe current checks of 4 to 20 mA without breaking the loop. In addition, the output function provides a simple way to log and monitor the data.Provided meter is precisely manufactured by our technocrats using the premium quality components in sync with the set standards of quality. In addition, this meter can be availed by our valuable customers at market leading price. Automatic Shutdown: After 15 min. Other Functions: Data hold, Analogue Bar graph Low Battery Indication.